[New for 2017] So Perry's sent over free samples of several new 2017 products and one of them happens to be lactose free (aka mixed with Lactase enzyme). The thing is, I don't think I've had the regular version so I won't be comparing the two. Looks normal enough (lines are from the plastic seal). The cookie dough bits are fairly dry but that might be from their ride with the dry ice. 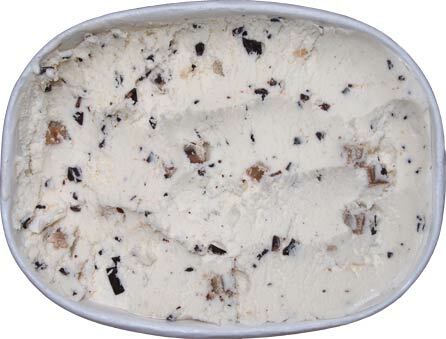 What's more important is any kind of sugary of flavorful blast they might add to the tame base ice cream. There's something there but it's faint. If you get like three on your spoon, then you can put your finger on a mild brown sugar aftertaste. The chocolate chips are very thin, tiny and hard to notice against the backdrop of plentiful cookie dough bits. It's hard to get a bite without cookie dough. I just tried several times and failed every time. Ok, got a dough free bite that time but still don't notice the chips. Ok, I cheated and got a little more for my bowl. The thing about this one is that it's all about the plentiful cookie dough in a respectable mainstream base. They haven't gone crazy with flavoring the base or giving us giant chips, it's all about the slow sugary build up from the cookie dough. On Second Scoop: I'm sorry if I sounded a little hard on this one. 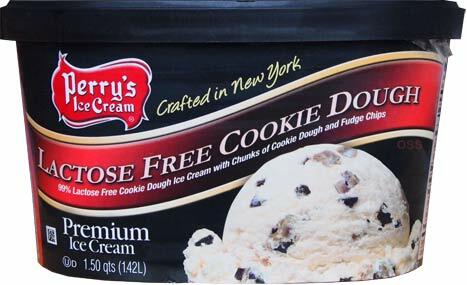 The reality is that "lactose free" options are pretty hard to come by and so you have to respect Perry's taking the time to offer up something different. History Note: For the record, Perry's sent a freshly scooped pint of their lactose free vanilla ice cream when it first came out in 2013. I thought it was fine but had unfortunately waited to try it last of all the samples sent at that time so it didn't make for much of a review. I don't know that much about lactose intolerance, but aren't there pills you can take so you can have one serving of regular ice cream, as long as you don't have any other dairy the rest of the day? I would think people would enjoy that more rather than comptomising their ice cream choices, unless they were equal in flavor to regular. But seriously, while the lactese doesn't greatly effect the product, there is a mild difference which will be noticed by people to various degrees (much like various opinions on sucralose). It's hard to describe, but their is a little oddness to the flavoring or texture that I couldn't put my finger on. 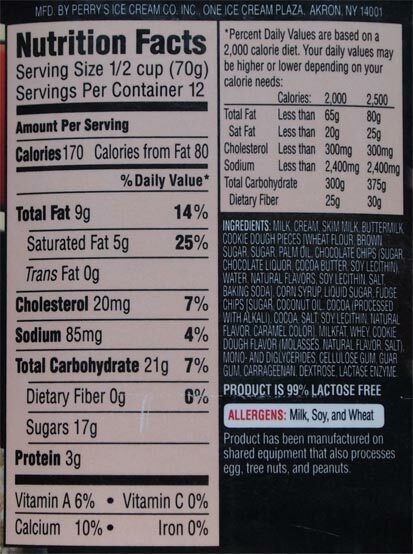 ---- I had also purchased some generic lactose free milk and it had a little bit of that same funk to it. The weird thing was that the milk seemed to taste more odd the longer it sat in the fridge, so I wonder if there is still something going on as it sat on my shelf. The pills don't work that well, so I have to limit myself to 2 servings of ice cream a week. Also, I usually have to eat a cookie or two and take about 6 pills with each serving. That makes it more expensive than buying lactose free milk/ice cream. I wish more ice creams came with lactase. It doesn't change the taste, since the ice cream is already sweet unlike milk. 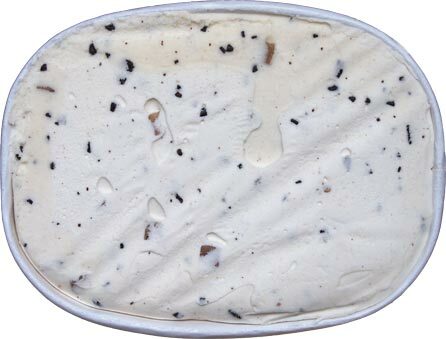 If Ben & Jerry's can make their own almond milk base, why can't they make a lactose free ice cream base? I'm willing to pay a little more. Lactose free I can definitely taste the difference, because lactose is a sugar, you can taste it. Enzymes are proteins, so I suppose you could taste it too now that I think about it. Lactose free milk will have a sweeter taste than regular milk because of the broken down lactose. On the other hand, the lactose free dairy in ice cream will blend in with the added sugars and other ingredients, so you won't be able to taste a difference. I'm unable to taste the lactase enzyme in milk. Even in milk that's filtered and sugar reduced like Fairlife or MooTopia. When I was in the hospital, you'd get the little milks and 50% of the time they were spoilt, and always warm, and I found the lower the percent fat, the colder they were. Once they gave me a lactaid milk, and it was so cold, so I continually ordered it. The lactaid milk was never spoilt and coldest of all. I grew to prefer it and it's sweetness from this experience. I miss Perry's so much! Living in upstate NY for years spoiled me. Their regular cookie dough is my favorite cookie dough ice cream, and probably in the top 5 favorite ice creams. Their scoop shops are the best.